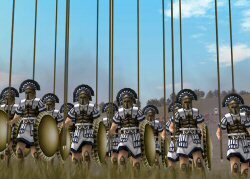 Rome Total War is simply one of those games that when you think you've seen it all with strategy titles, it just comes up and delivers a series of snappy uppercuts as it redefines what we should be expecting out of this genre! This is the third game in the series from The Creative Assembly, the first being Shogun, the second Medieval both of course sharing the Total War name. It's terrible almost to note this first but holy guacamole batman, this game sure does look fine! Utilising a new 3D engine, I'd have to say this is the finest looking strategy game I've ever seen in terms of attention to detail and the ability to portray large scale confrontations. In the spirit of the previous two games we are faced with a couple of distinct playing style that make this game so much fun. There is the straight forward strategy gaming scenario which is turn based and is what we are all familiar with. Then there is the up close and personal battles that play out in glorious detail and even more importantly, in real time. First things first, there is a tutorial level at the start of the game that will teach newcomers how to operate the game and will re-familarise old hands about how to take on the enemy face on again. As the title indicates you get to play the part of three prominent Roman families, the Julii, the Bruti or the Scipii. The neat thing is that you choose the one you want to play as and the others will assist you in the general stewardship of Rome. As your quest gets more involved and you get closer to overtaking the city, the families loyalty to each other comes into question as the quest for power overtakes old friendships. There's another force that I came into contact with early in the title and it's the one that almost means the most out of any of them and that is the Roman Senate. These guys really run the show and will send you about on missions. As you get more things done you will attract hangers on called retinues that will enable you to exert your sphere of influence to a greater extent. It seems with this game that they've got all the bases covered in terms of gameplay with both a long and short option of taking on the enemy. Quite often a gripe with strat games is simply that "they take too long". 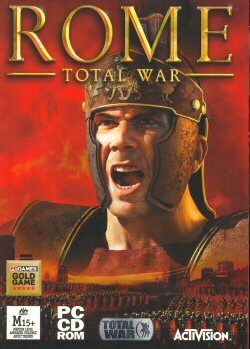 Which I actually thought was the point, however... Rome: Total War gives you the normal option of a massive campaign that you will feel like playing forever and seeing how it all pans out. The shorter game is simply a streamlined version of the main campaign in and of itself with lesser areas to take over. However history buffs will be really pleased to see that you can also take part in historical conflicts to see how they would have panned out if you had been at the helm at the time. Sweet eh? Another great touch to this game is the campaign map has been totally jazzed up to create an even greater feeling of having more control over what you see. Rendered in 3D with a great amount of detail, the map will become imperative for you to monitor exactly what is going on throughout the entire game as opposed to an occasional reference item as is so often the case in other games. This time it will become readily apparent how crucial keeping on eye on things has become. As those who play the game does so to it's end, that's when you realise that although you have been playing this game for what feels like a large portion of your natural life, you've only scratched the very tip of the iceberg with adjustable AI and unlockable races to play as to make this little piece of excellence go that step further. With the unlockable aspects of the title, PC gamers who are cringing at this feature should be more than happy with the knowledge that it isn't exactly the same game again just with different characters. You unlock a race and their strengths and weaknesses come into play along with geographic circumstances. Although I must have to admit I loved this game primarily for how easy it is to actually just get in and play it, once you are used to that make sure you get in there and really play with the nuts and bolts as there is stacks of data ripe for those who need the intensity of statistics like those presented in the Civ series, the thing is that you won't neccesarily need to constantly monitor them to achieve your ambitions. So far I bet you are wondering why this game is not getting a 10 out of 10. Well it's a big call to slap that on and I've been accused more than once of doing so when it was not deserved. It's just a matter of opinion. 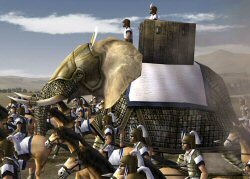 The only gripe I have with this game is during major battles, the AI army assisting me did not alway perform the way I would have imagined, that's all. There's minor things like when on the occasion I'd pull my men back from the battle to do something strategic, my AI general would rally the troops to him to continue the attack. Another little oddity was that all children are born in the capital which means for some lengthy journeys to get them where you wanted them to be. From an audio standpoint, this game is no slouch either, with sound playing an integral part in the overall gameplay experience. One of the things that I particularly enjoyed was the great battle soundtracks with speeches given and even a simplistic running commentary of sorts. Music really makes the rest of the title with appropriate compositions at exactly the right moments making this a most immersive gameplaying experience. All things said and done, Rome: Total War is the finest strategy game out there on the market at the moment hands down and the fact of the matter is that this review barely touches the surface of all the things that made it so much fun. For those who like the long haul, well this game's got it in spades. For those of you who like a quick strategy fix, then it's also for you. Folks, there's very little wrong with this game and the stuff I pointed out is purely pedantic on my part. If you want a great strategy game then simply put, this one is perfect.